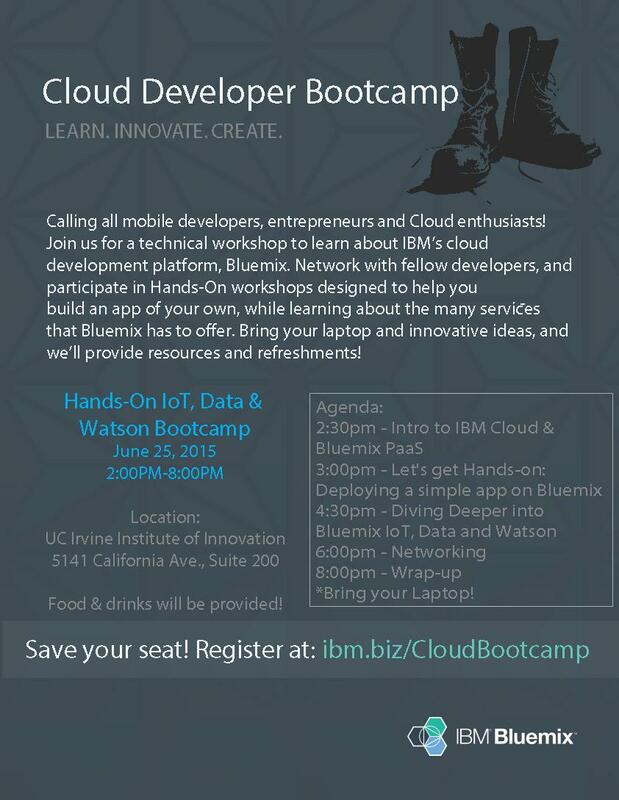 This free event will focus on IBM Bluemix Platform-as-a-Service through a series of hands on workshops with experts as participants learn how to quickly build and deploy an application using the Bluemix platform. These workshops are designed for those wanting to use the technology to create new businesses, gain new skills in their current job or to prepare themselves for new positions or business opportunities. This event is open to individual developers, corporate developers, startups, entrepreneurs, students, professors, and anyone interested in learning and networking. Richard returned to UC Irvine as the Executive Director of the Institute for Innovation in August of 2015. Richard currently is an active angel investor, and Chairman Emeritus of Tech Coast Angels (TCA). Through TCA, Richard has screened in excess of 1,000 startup companies. TCA, the largest angel organization in the U.S., has invested over $150+ million in more than 200+ startup companies. In addition, these companies have received over $1.4 billion in additional financing. He serves as Research Committee Chair for Angel Capital Association (ACA), a national organization of angel groups throughout the U.S. representing over 8,000 angels. He currently sits on and has participated on boards of engineering and high technology companies and non-profits. His consulting activity focuses on CEO coaching, executive management development, and strategic planning for startups. Matt Marriott is the Vice President for IBM's services business in the Southwest and Rockies Region. He has held a number of leadership positions within IBM's consulting, sales and marketing units over his 14-years with the company. Prior to his work at IBM, Matt worked in consulting for both JDEdwards and Dentsu Advertising. Matt has been a guest speaker at APEC as well as a guest lecturer at the Leeds School of Business at the University of Colorado and the Tuck School of Business at Dartmouth University. Matt received his bachelors degree in Political Science from Brigham Young University and his Masters Degree in Business from the University of Colorado. Matt makes his home in Laguna Hills, CA with his wife and two daughters. When Matt isn't working, you'll find him swimming, biking and running. Feyzi Fatehi is a Silicon Valley veteran with 25 years of leadership experience building high performance teams at HP and multiple software start-ups that commanded more than $1 billion in valuation. He has been a speaker at Harvard Business School, Wharton, Stanford, Pepperdine and UCLA Anderson School of Management. Feyzi is a member of the IBM Partner Advisory Council, as well as the UC Irvine Chief Executive Roundtable and serves as the chairman of the Technology Council of Southern California/ Orange County. He has a BS in Solar Engineering, an MS in Software Architecture and an MBA in International Management. As Director, Global Cloud Marketing, Dan Shapero is responsible for establishing and overseeing Ingram Micro’s global cloud marketing strategy and plans, as well as working with the company’s regional and local cloud business to execute the strategy and create growth and recognition in the marketplace. Before joining Ingram Micro, Shapero founded ClickCloud, which supplies the IT channel with turnkey digital marketing options on a fixed-fee monthly subscription. He also held executive positions at Kaseya, where he worked in global marketing and served as executive vice president and general manager for the company’s On Demand Division. Global marketing executive, who is a consummate “builder”, with a track record of reigniting growth through the innovation of products, brands and initiatives. Thought leadership and performance. Focus on new channels, markets, partnerships, and increased market share. Professionally trained and tested at IBM Corporation, with a Biology Degree from UC Irvine and an MBA from the Purdue University. Darcy develops high-powered marketing/sales organizations that succeed in highly competitive markets, by combining vision with execution. Darcy also serves on the board for UC Irvine Institute of Innovation. She and her husband reside in Orange County with their three children.